... und hier ist sie schon: Die nächste Karte mit dem Kranzstempel von Hero Art und einem Spruch von AEH- Design! So pretty! Perfect for the inspiration photo - beautiful rolled roses - so elegant!! Love the handmade flowers. Great project! I noticed your entry on Make it Monday and wanted to come over to take a closer look. If you’re interested in checking out my entry, I’m entry # 152. Hope to see you stop by and leave me a comment! Wow, die ist superschön.. auch die anderen Sachen gefallen mir sehr und Du bist ja wahnsinnig kreativ z.Zt. Thanks for joining us at The Ribbon Reel Challenge Blog this week! Very pretty! Love those flowers. 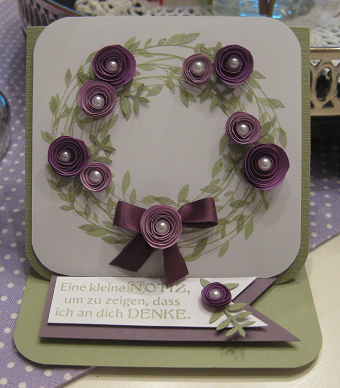 Thank you so much for joining us at Craftin Desert Divas “Ribbon or Twine“ Linky Party. New Linky Party starts Monday hope you will join us again!! Love your beautiful elegant rolled roses. Love this beautiful wreath and your pretty rolled roses! Thanks for joining TRR! Adorable card! Love the flowers and pearls. Thanks for joining the TTCRD challenge, and good luck. Beautiful creation. Thank You for sharing with us at Lady Anne's Challenges. I hope we see you again soon. Beautiful rolled roses, love the colors you chose. Thank You for sharing with us at Lady Anne's Challenges. I hope we see you again soon. Wie genial ist das denn? Der Kranz und dann noch die selbstgedrehten Blumen - einfach der Hammer.